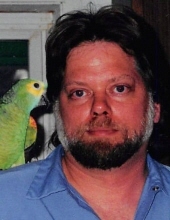 Richard G. Bodoh, age 58, of Fond du Lac, died Monday, February 4, 2019, at St. Agnes Hospital. He was born on June 24, 1960, in Illinois, the son of Royce and Marion (Rice) Bodoh. On August 2, 1997, he married Yvonne “Bonnie” Hernandez in Fond du Lac. Richard served in the United States Army. Richard worked as a truck driver at Legacy Express. In his spare time he enjoyed beekeeping, riding his Harley and was a member of ABATE, his dogs, joining clubs and helping people, fishing, hunting, camping, waterfalls, and basically everything outdoors. Richard was a member of Moose Lodge and former District 31 secretary and he was a member of the NRA. Most of all Richard loved his grandchildren. Survivors include his wife Bonnie Bodoh of Fond du Lac; one daughter, Amber (Jacob) Bodoh of Fond du Lac; one step-son, John Joseph Steiner of Green Bay; one step-daughter, Angela (Anthony) Tennis of Fond du Lac; six grandchildren, Eve, Antoniea, Arabella, Kayla, Justin, and Gabrielle; his siblings, Bruce (Lori Schneider) Bodoh of Fond du Lac, Brad (Sheri) Bodoh of Casper, WY, Janelle (Justin) Nehring of Fox Lake, WI; his step-mother, Angeline Bodoh of Fond du Lac; in-laws, Michael Hernandez, Diane (Jeff) Mand, Robert (Bing) Hernandez, Michelle Kunz, Danny (Joanne) Hernandez; former wife, Linda Bodoh of Fond du Lac; and many nieces, nephews, other relatives and friends. He was preceded in death by his parents; and one brother, Jeffrey Scott Bodoh. Visitation will take place on Saturday, February 9, 2019, from 3-6 PM at Uecker-Witt Funeral Home, 524 N. Park Ave, Fond du Lac, WI, 54935. A private family service will follow the visitation. Cremation has taken place. In lieu of flowers, memorials appreciated to the family. To send flowers or a remembrance gift to the family of Richard G. Bodoh, please visit our Tribute Store. "Email Address" would like to share the life celebration of Richard G. Bodoh. Click on the "link" to go to share a favorite memory or leave a condolence message for the family.